The first time I remember seeing the tent was during the summer of 2007. My wife, Michele, and I were newlyweds living in a duplex in Cleveland Heights, Ohio. We worked our tails off, but week-to-week we were just managing to pay the bills. Who needed money when everything was new and exciting though, right? The Browns were back, but they had been awful for years. The Indians had struggled through several seasons. Long gone were the powerhouse Tribe teams of the 90’s. The focus of Cleveland sports nation fell squarely on the shoulders of Lebron James and the Cavaliers, who were finding a rhythm in the playoffs. For twenty bones, I managed to get my wife and I into a first round game against Washington at halftime. The Cavs had battled the Wizards in the playoffs the previous year, but this time it was all Cleveland. Gilbert Arenas and Caron Butler were both injured. So we reveled in putting that dirt mcgurt, Deshawn Stevenson in his place. And don’t get me started on Brendan Haywood. Not since Albert Belle slammed home runs and doubles at a Hall of Fame pace had we witnessed anything like this. A day or two after the Cavs advanced to the Finals, I saw it. Someone had set up a merch tent on the corner of Lorain and Lear Nagel in North Ridgeville. The tent was bright, though obviously well-worn. A woman hung shirts, jackets, and other Cavaliers inspired merchandise on each side. Large signs, black marker on neon paper, offered pricing info. Over the next couple days, I passed that tent several times without stopping. I thought even though I was tall and fat this place might have my size. A t-shirt, a jersey, or anything else I could wear to show my love for the team. But still I didn’t go. The Cavs looked overmatched against the San Antonio Spurs. That’s as positive a spin I can put on the first three games of the series as a total Cleveland homer. They had no answer for Tim Duncan or Tony Parker. While picking up lunch in the Coventry area, NBA great, Grant Hill, passed right by me on the sidewalk. I didn’t interrupt him, but I thought it was cool to see celebrities hanging in my neighborhood. Look, Cleveland doesn’t get much attention or respect on a national scale and we have a complex because of it. We aren’t flashy. We aren’t used to the spotlight. Our beards aren’t trimmed, our clothes aren’t in style, and we don’t care. Tony Rizzo, a sportscaster on WKNR disagrees with my blue-collar Cleveland take, but I can only go with what I see, hear, and smell around town. Grab your thermos, lunch pail, and for goodness sake, don’t forget your hardhat! Before the fourth game I found myself in North Ridgeville again. This time the tent had a new sign, “50% OFF EVERYTHING.” Apparently, they didn’t have any confidence that the series would extend beyond the next game. I laughed. There was no way Lebron would allow the series to end so quickly, especially at home. I approached the tent. A few other patrons were picking through what was left, which wasn’t a lot. I left with a pair of junior-sized overalls and a cheerleader outfit for the son and daughter we didn’t have. Before you could say, “Bad prediction on the comeback, Doug,” the finals were over. The tent remained for another week, now emptied. One final reminder of what could’ve been. Later that year my wife and I bought our first home in Brook Park, setting in motion the biggest housing market crash in a century. Everything we saved for got swept away quicker than the Cavs in the ’07 Finals. We would’ve been better off buying the tent. In 2008, 2009, and 2010 the tent made brief visits as the Cavs failed to advance into the Finals. Rumors of Lebron leaving town swirled through the newspaper, TV, and radio shows every day, all day. When the Cavs fell behind the big-three-fronted Celtics and Lebron developed a phantom elbow injury, it was painful to watch. Lebron left the court and tore off his jersey as all the pressure to break our curse fell off his back. On the night of The Decision I was at my buddy Adam’s house to listen to new snippets of songs he had cooking. We have a music project together, called Indoria, which we have worked on (and off and on again) since we met, back in ‘98. One of the songs had a folk-pop feel that intrigued and intimidated me. I tried a few patterns but it wasn’t clicking. Adam didn’t have cable, so when it came time for Lebron to announce where he would play the next year, we had to shuffle to the bar next door to witness it. We ordered beers and shots…Cleveland. As number twenty-three spilled the beans on where he had decided to take his talents, we downed our shots. We then joined in with the bar patrons to boo, jeer, and vent our frustrations. Here was Cleveland getting shortchanged again. Here was a homegrown guy leaving for greener (or at least sunnier) pastures. Here was a kid that I had taken my dad to see play in a high school game shunning our city. Adam bee-lined for the entrance. He yelled, “(edited for the younger readers)”, and slammed the bar door. I drank my beer, listening to that smarmy Jim Grey spewing whatever nonsense, rat poison he wanted. Then I drank Adam’s beer and stewed before stumbling back to his place. “Put on that pop/folk song again,” I told him, adjusting the headphones and stepping to the mic. I didn’t have lyrics, but I had a theme. It wasn’t abandonment or betrayal. It was the weight of expectation and doing something despite feeling torn, exhausted. It was about frustration. It was about needing to leave the nest to experience the world at large. It was a coming of age tune for college freshman, which in a way, Lebron had become. Within a couple of weeks my wife and I recorded our vocals for, “South Bound”. The song wasn’t perfect, but it made me feel better, and I never turn down an opportunity to hear Michele sing. In January of 2011 my wife and I welcomed our son into the world. I knew someday Owen would proudly don the overalls I got in the tent. The Cavaliers plowed through their first season sans Lebron. Draft talk was already the media’s focus during summer league. We cheered on the “Maveliers” in the Finals. We delighted in watching them defeat our former hero. Petty? Yes. Deserved? Hell yes. Would I do it again? Hopefully, I don’t have to find out. I didn’t see the tent that year. Or the next. Though, we did welcome our beautiful daughter, Mara, to a life of Cavaliers fandom. I knew one day she would rock the cheerleader outfit that I found in our tent. 2013 brought no kids or tents. Adam and I started to discuss the next Indoria release. I told him I wanted to redo one of the songs from our previous CD. “Southbound” no longer sat well with me. It was bitter. Not that it sounds angry, but the memories tied to it certainly were. I’d never seen Adam slam a door, before or since. I’d never seen Adam abandon a beer before or since. That day was dark, man, dark. I decided the hook should change from, “I’m headed Southbound,” to, “I’m headed home now”. I wanted to focus on redemption, rebirth, and second chances. I waved him over to my car so he could listen. We nodded at the maturity and respect and cold hard truths Lebron had spun. The essay is stunning. Go read it. I don’t care if you’re a Cavaliers fan or if you hate Lebron, it strikes a chord. 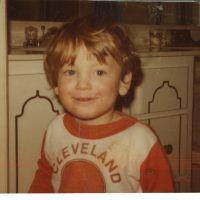 As a sports fan, a son, a father, and as a Clevelander, I beamed with pride. Within two weeks, “Home Now” got recorded. This time we celebrated renewal, forgiveness, and the hopeful return of our tent. The lyrics reflected the spirit of the essay, sometimes verbatim. My wife and I bought a bigger house, in North Ridgeville. Every time I went to and then returned from work I passed the tent’s spot. The Cavaliers did indeed reach the Finals in 2015, minus two of their best players. My kids sported the gear I bought them eight years before. The Cavs came up short. I didn’t ever see the 50% off sale, but I did visit my tent a couple of times. In 2016, I joined Chuck Mosley on a rock tour headed all over the country, the United Kingdom, and to France. The Cavaliers got back to the Finals, but I wasn’t home to see the tent. I purchased my family (officially licensed) Love, Thompson, and Kyrie jerseys. I bought myself one with Shumpert’s name on the back. I rotated wearing it with my Larry Hughes jersey in every small club we played from San Francisco to Paris. Before playing a concert in Seattle I walked around the downtown area to find a bar to watch Game Seven, but no one had it on. The city had a team stolen from them, so nobody wanted to give the NBA any attention. Luckily the club we were playing put the game on. I watched with a great couple from Beaumont, TX. They had no skin in the game, so they cheered with me. I stood as Lebron made, “The block”. My heart stopped as Kyrie drew up and shot the eventual game winner. My jaw hit the floor as Kevin Love shut down Curry. I peered around in disbelief as the seconds ticked away. Those weekend Warriors couldn’t get the ball out of the corner in time to do anything. The world stopped dead in its tracks as the overwhelming truth of the joy I felt washed over me. The Cavs defeated that ball-kicking caveman Draymond Green. They silenced that boy band cast-off Klay Thompson. And best of all, that kid with super-glued hairs on his chin hid under a towel. Hey, Steve Kerr (a former Cavalier), take your smug grin and your goon squad of Zsa Zsa, Iguodala, and West, and go home. For once, the good guys proved victorious. Lebron announced, “Cleveland, this is for you!” on national television. My wife and her friend Donna, screamed, cried, and from what I gather, doused a downtown bar with a shower of beer. They FaceTimed me from inside a parade of thousands of the happiest people that ever lived. Chuck and I drove forty-nine straight hours home, the tent greeting us as we exited the turnpike. Over two million people gathered downtown for the official celebration. Most of them, like J.R. Smith, went shirtless. Another tent got set up near where we were recording the next Indoria. Instead of two times, I started passing a tent four times a day. And they stayed, boy, oh did they stay in business. June turned to July turned to August and still, as the school year began, we had championship fever. And tents. A few short months later, the Indians took us to the series, and yes, the tent returned. The Tribe battled the Cubs to a thrilling game seven. My father came over to watch and I had convinced him to stay, even after the Tribe got belted in the early innings. On my deathbed I’ll remember the moment Rajai Davis belted a home run with two outs in the eighth inning. I glanced at my dad with dumbfounded disbelief before we cheered our heads off. The home run tied the game and gave the Tribe all the momentum. The contentment I felt at having my dad there to share the moment with felt as great as winning. The Cavs failed to repeat in 2017. Kyrie appeared to have better things to do than fight for the win. It was no surprise that he requested a trade not long after. I had to witness those fleabags from the Bay Area win due more to our inner turmoil than because they earned it. Adding insult to injury, a hotel we stayed at in Oakland hosted a championship trophy event that day. All six of the fair weather fans showed up. I wore a Cavs jersey and held my head up high. The next season boasted an amount of drama that I hadn’t experienced since high school. Players came and went, rumors flew, and the team never gelled. Thompson and Love battled injuries. J.R. waged a war inside of himself. Our new point guard missed the first half of the season and appeared clueless when he did take the court. Hood and Clarkson joined the team. Both players can score, but something held them back. Larry Nance Jr. came via trade. It was a treat for Clevelanders and for his father, a former Cavalier who still lives in the area. They limped into the postseason and almost got bounced by Indiana. Toronto folded in four. Boston came out swinging. No one gave the Cavs a chance. The tent still wasn’t set up as the series evened to three games apiece. But then, the Cavs found something. It wasn’t pretty. It wasn’t sustainable. It wasn’t…it didn’t matter. Lebron lifted the team onto his shoulders and repeated the run he had had in 2007, all those years ago. Down went the Celtics. Down went the hurt from 2010. Down went any doubt that Lebron wasn’t the best I had ever seen. I came home from work two days later and there it was, the tent. It stood in the same spot, as always, though the merchandise now featured the slogan of the season, “Whatever It Takes”. On the night of Game One we watched the referees destroy any chance the Cavs had to win the series. You could see it in the player’s eyes even before the game went into overtime. Lebron played a game for the ages, but the men wearing whistles ripped victory away from him. With the Cavs down three games to none, I decided to pick up a discounted rally shirt at the tent. I wanted to cheer their comeback. I wanted to show, again, that I’d never give up on them. The tent was empty, already abandoned. It was a punch to the gut. How dare they? The Cavs still had a chance. That night they would defend the land in game four. Sure, victory in the series would take a miracle, but, wasn’t it our team that came back from down 3-1 only two years earlier? I passed by the empty tent caught off guard by the feelings it brought up. The last sweep in the NBA was in…oh yeah, 2007, the first time I set my eyes on this failed camping accessory. Unfortunately, many of the Cavaliers had already joined the tent operators ‘in Cancun’. Game Four was a sloppy affair from the opening jump. I watched until the bitter, bitter end. The tent is gone again. The frequency of times I’ve seen it is a testament to Lebron’s elevation up the NBA hierarchy. He stands with only the best of the best of the best as peers. He’s a free agent again. I saw Lebron play for the first time shortly after I turned old enough to drink. Now, I’m thirty-nine. My wife and I started dating during Lebron’s rookie season. We got hitched over eleven years ago. My kids are seven and five. We’ve gone through several cars, a few jobs, three apartments, and two homes since Lebron joined the NBA. We’ve recorded over thirty Indoria songs since I first saw the tent. I’ve written three novels, a nonfiction book, and a couple dozen short stories since, “The return”. As I type this at a bar in Tremont, the trio at the next table is talking about Lebron, stay or go. The bartender and five or so patrons are discussing it too. The folks on the TV are dissecting rumors and theories of why Lebron could remain a Cavalier or relocate to Los Angeles. Read the paper, turn on the radio, or visit any sports website and you’ll find the same story. If Lebron goes, the team will have a lot of work to do to succeed in a post-James era. If he stays, the Cavaliers may not acquire enough firepower to earn more Finals appearances before he retires. This entry was posted in my writing, this guy! and tagged Basketball Jersey, Cleveland Cavaliers, Detroit Pistons, esper, Golden State Warriors, Kyrie Irving, Lebron James, North Ridgeville. Bookmark the permalink.